I awoke this morning to find an alarming mail in my inbox. 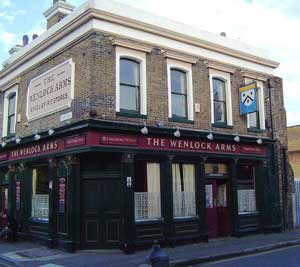 It informed me that one of my favourite pubs, The Wenlock Arms, was under threat of demolition. For those of you who don't know this place, just off The City Road, it has for many years been one of the premier real ale pubs in London and also a regular watering hole for Dos Hermanos. If you search through the well over 1000 blog posts on DH you will see many mentions of a few pints at The Wenlock Arms, often as Saturday early evening treat and, just as often as the first half of a double act, to be followed by a meat heavy meal at our beloved Angel Mangal. To our dismay, The Angel Mangal closed in 2007 and now it appears that The Wenlock Arms may be following it down the path to becoming little more than a fond memory. It is not a smart pub, the floors are sticky, the ceiling is still yellow with a thick coating of cigarette smoke and the only food on offer is limited to a handful of decent doorstop sandwiches. 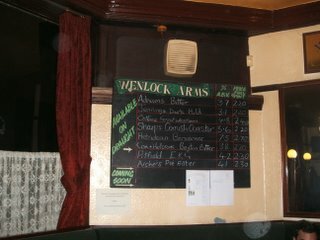 But, The Wenlock Arms is a real pub, delivering excellent real ales at good prices. Over 2000 pubs a year are closing in the UK according to, er me, in a piece I wrote last year for The Guardian's Word of Mouth Column. I hope that by the time I return to the UK in October, The Wenlock Arms wont be one of them. Hello! Thanks so much for posting this - we really appreciate it. I'm glad to hear that you two are fans. We're concerned that the offer currently on the table wouldn't actually save the pub from demolition. Our job is to show the buyer that it's an amazing asset to London and Wenlock Road, and it deserves to stay a pub. You could rename it something DH-suitable? Terrible news. Anyone arranging a sit in can count on my support.